Dot maps for the Orthoptera show a good coverage of the county for most species. 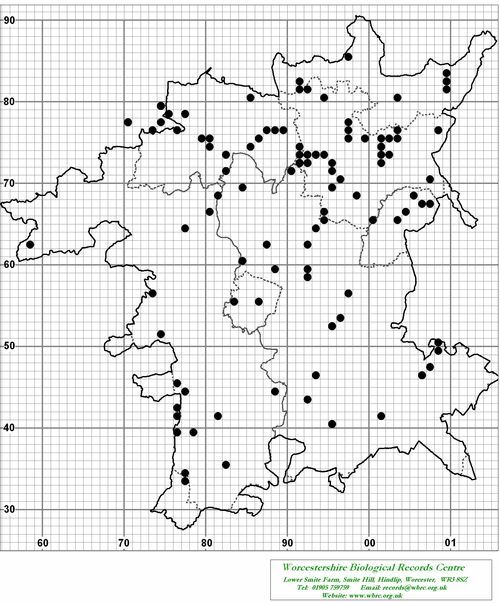 There are blank areas, some of which can be explained by the larger conurbations leaving little space for suitable habitat; some areas have simply not been surveyed for this group and there is the ever present element of the maps showing recorder effort rather than species distribution. All of these factors can be taken into account and explained. It is when the records are viewed in more detail that the interesting questions arise, especially when recorded dates are examined. For example, two maps for Common Green Grasshopper Omocestus viridulus are reproduced here from data held at Worcestershire Biological Records Centre (WBRC). The map with black dots (01) shows all records for this species to the end of 2012 mapped as 1x1 km squares (monads) and there is lots of white space but a good spread of records. However, the coloured map (02) shows the records split between pre-2000 and 2000-onwards painting a picture of a species in serious decline. 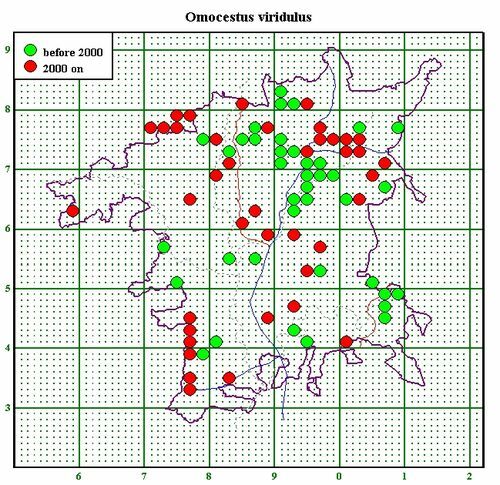 On the coloured map the green dots indicate 2x2km squares (tetrads) which have records before 2000 but none since. Records since 2000 are shown by red dots and these replace green if there was an earlier record. In fact the details of the records show that of the 134 records held at WBRC 71 are pre-2000 and 41 of these are pre-1951. Many of you will not be surprised to learn that 36 of the pre-1951 records are those collected by Fred Fincher. So why so many early records with no corresponding post 2000 records? Much of this can be accounted for by the attraction of honey-pot areas; recorders are drawn to areas where there are things to record (nature reserves etc.) rather than searching in the wider countryside. Take for example a cluster of records in SO96 and SO97. In 1947 Fred Fincher took a walk along the canal tow-path between Stoke Prior and Hanbury, recording Orthoptera as he went; no one has done this since so the species is shown on the maps as being present pre-2000 and not since. In 1953 Fred Fincher produced a short paper Orthoptera - Some notes on Orthoptera and Dermaptera in the West Midlands which notes the Common Green Grasshopper to be “common in north Worcestershire between Bromsgrove and Kidderminster”. Is this still the case? In the case of the commoner species it is possible to review the old records and be confident that they are accurate especially when accompanied by more detailed information such as Fincher’s 1953 paper. They are extremely useful to inform follow up surveys which will give some conclusions about the fate of these species in areas where they were previously common. There are a few species on the Worcestershire maps though which require more research into factors affecting their national distribution and possible confusion species. Of records worth researching the Wood Cricket Nemobius sylvestris is most intriguing. Fred Fincher reported that he took an immature cricket in Shrawley Woods in April 1948. The specimen was submitted to national experts who agreed that it was “possibly” a Wood Cricket but they were unable to confirm this due to immaturity. He concludes “As no further specimen has yet been secured it cannot be fully admitted to the list”. This species has a biennial life cycle, over-wintering as a half grown nymph. It becomes fully active again in April which fits well with the time of year that the Shrawley specimen was taken but would have measured only approximately 5mm long at that time of year. Interestingly Ragge (1965) notes that the Wood Cricket is only known to occur for certain in south coast counties and south Wiltshire. He does however note that there are “... doubtful records for…Worcestershire and even Derbyshire”. This is a wingless species requiring old hedgerows and open woodlands in warm locations so it is highly unlikely that it will occur in this county, but was it here in the past? The second species is more likely to still be present. This is the Stripe-winged Grasshopper Stenobothrus lineatus and has been recorded at two locations on the southern Malvern Hills (Ragged Stone Hill in 1995 and the reservoir dam wall in 1999). Ragge describes it as a species with a “..preference for dry localities, especially where the local rock is limestone. Away from limestone [it] is usually found on sandy soils.” I have searched various parts of the Malverns for this species, including the dam area without success but I have not yet been to Ragged Stone Hill. A recent exchange of emails with Peter Garner (the recorder for both records) suggests that Peter found Stripe-winged Grasshoppers at the dam wall and this was confirmed by Don Goddard. It appears that Don Goddard had then commented that he had found this species at Ragged Stone Hill and so this was recorded. Further searches along the Malverns may well prove fruitful but this is a secretive grasshopper and is very similar to the Common Green Grasshopper which is abundant on the hills. The third species is the Bog Bush-cricket Metrioptera brachyptera which has been recorded for Bredon Hill (2006). This is a flightless species of wet heathland and moors and Ragge notes that “the occurrence of Cross-leaved Heath is often an indicator of its presence”. Haes and Harding (1997) concur with this and add that Purple Moor-grass is also usually present where this bush-cricket is found. It is widespread but local nationally being found at scattered localities across England and Wales and has been found in Scotland. It has been found at sites fairly close to Worcestershire including locations in Shropshire and on Cannock Chase but it has never been found in the heaths of north Worcestershire despite searches. Further searches in the south of the county will be required. The last species on this list is the Great Green Bushcricket Tettigonia viridissima. This is a large, loud bush-cricket which should be unmistakable so why should I question any records for species? WBRC hold 11 records for Great Green Bushcricket between 1947 and 1981, eight of which are from Fred Fincher from four sites (Randan Wood 1947, 1950, 1951; Drayton Pool 1947, 1948; The Slings 1947, 1948; Upton Warren 1948). Despite the significance of these records there is no mention of this species in either Fred Fincher’s 1953 paper or a follow up article from 1970s. The possibility of confusion with Oak Bushcricket did cause some doubt but WBRC have records for the latter species from the same period for the same recorder. Are there any records from adjacent counties during the 1940s, or do these records match a run of hot summers? Further digging required. Of the remaining three records for Great Green Bushcricket, one is from an anonymous recorder so can not be verified. The other two are both for Nafford from Peggie Pittkin 1980 and M.P. 1981 (these two recorders are considered to be the same person). Great Green Bush-cricket has certainly been expanding its range from the south through Gloucestershire in recent years so could these have been from an unsuccessful range expansion over 30 years ago? Doubt arises as this is the only species of Orthoptera reported by this recorder so could they have been the result of encounters with Oak Bush-crickets on a couple of occasions? If anyone can shed any light on these records or has any other old records of Orthoptera please let me know so we can ensure that the proposed atlas is as accurate as possible. Any photos of new or old sightings can still be emailed to me at vc37hopper@gmx.com. Fincher, F. 1953. Orthoptera - Some notes on Orthoptera and Dermaptera in the West Midlands. Entomologist’s Record 65:151-154. Haes, E.C.M. and Harding P.T. 1997 Atlas of Grasshoppers, Crickets and Allied Insects in Britain and Ireland. London: The Stationery Office. Ragge, D.R. 1965. Grasshoppers, Crickets and Cockroaches of the British Isles. London: Frederick Warne & Co Ltd.
Marshall, J.A. and Haes, E.C.M. 1988. Grasshoppers and Allied Insects of Great Britain and Ireland. Colchester, Essex: Harley Books (B.H & A. Harley Ltd.). 01. Omocestus viridulus all records.